Academic Work was founded in 1998 by three students who saw an opportunity in young professionals. The business that was born in a boiler room at KTH is today the second largest staffing and recruitment company for civil servants in Sweden. They are currently represented on several European markets such as Norway, Finland, Denmark, Germany and Switzerland. When we started the collaboration, the brand had grown out of its suit. 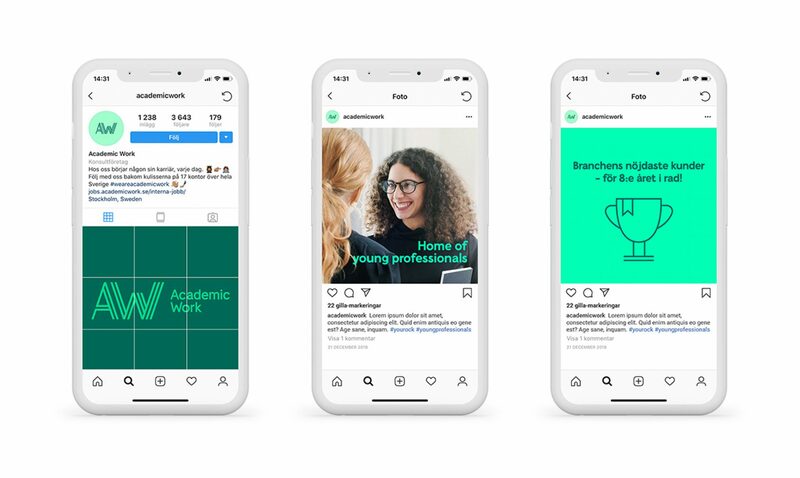 Academic Work needed a new brand and design strategy that brought together the family and gave direction for brand relations. Academic Work also needed a new visual identity, responsive and adapted for digital and mobile channels. The graphical toolbox needed to be broadened with more identifying components. Together we developed brand architecture, with a collective family brand and a strong relationship between the mother and daughter brands. The short name AW was introduced to create a clear red thread in the family's logos and names. Identity is based on the idea that AW makes people grow. The core became the symbol, a green color world and its own font family. Together with imagery, patterns and icons, a complete toolbox and a distinct visual identity were created that weld together the entire family. The symbol represent the short version of Academic Work. It is made up out of lines that continues to develop thus representing the ambition with people working at Academic Work. It exists in 5 different versions to be optimal in a responsive world. Academic Works world is natural green. We extended and clarified the green colour palette and extended it from 1 to 7 nuances. We then designed a modern typeface with personal characteristics that embraces the diversity we see in people. It is designed to work well in digital and print channels, communication as well as legal documents. It can be bold, informative or very expressive. The pattern is derived from the symbol and is used to express the dynamic growth and ambition with the people that works at Academic Work. We also continued to develop icons that visually connects to the symbol and pattern which secures the visual identity even in very small contexts. We created a dynamic designsystem that emphasize on being flexible and dynamic. This way it is easy to use and adjust towards every markets special needs. All applications including the Brand Guidelines is utilizing the toolbox in a way that should reflect Academic Works brand values: Share energy, Beat yesterday and Show heart. The flexible and dynamic designsystem enables all responsive needs in digital channels, creating a layout that reflects Academic Work’s ambition as a progressive and innovative company.